James Mola is a 67-year-old former educator who retired in Cuenca, Ecuador. Originally Chicago, USA, Mr. Mola moved out of his home country to escape the high living costs, cold winters and windy weather in favor of a more favorable climate. Presently, Mr. Mola has lived in Ecuador by himself for over 3 ½ years now since 2011. Mr. Mola said that his most difficult experience as an expat involved speaking the local language. “I don’t devote sufficient time to the study of Spanish” he admitted, but said that all of his Ecuadorian friends can speak English. Mr. Mola said that the expat community has grown since he arrived and in response the city government has a special English-speaking security force to help tourists and expats. He also expressed his frustration with the formalities of moving into Ecuador, as procuring a visa was difficult back in 2011. “By far, the most negative problem with which I have had to deal as an expat has been governmental and financial institutional bureaucracies,” he said, explaining that procedures such as handling investment transactions, moving money in-and-out of countries, complying with both the United States and Ecuador’s’ financial information forms have become quite complicated at present. “The changes with financial and government procedures and the complications caused by them are always on-going and never-ending. That, for me, is the most negative feature in living abroad, and an issue that many future expats give little consideration,” Mr. Mola said. The international moving procedure can be a hectic process, and many expats may find themselves faced with several obstacles before they make the big move overseas. With this in mind, expats are advised to consider availing of professional immigration services which can provide assistance when it comes to the immigration policies and rules of the country that expats are interested in moving to. In addition, being able to converse with the residents via the local language is a skill that can make expat life much easier. However, it isn’t easy, as learning the local language is always a big challenge for any expat. One way wherein expatriates can expose themselves to the local language is by joining several clubs and associations around the area, which can also help them meet locals. Find out more about James Mola’s experiences in Ecuador in his full interview below. A: I was born and raised in the Chicago area of the United States. A: High cost-of-living, polar winters, hot and often humid summers, windy conditions--all contributed as push factors for leaving the United States. A: I live in Cuenca, Ecuador. Cuenca is located in the Southern Andes approximately 8,200 feet elevation. Despite our high altitude, we never have snow nor freezing temperatures due to the fact that Cuenca is just south of the Equator. A: I have been living in Ecuador for over 3 ½ years now. A: Not speaking Spanish may have been the most difficult experience. Nevertheless, there are many Ecuadorians who lived in the United States and upon their return provide facilitation services for a fee to expats. The services can include rentals, property purchases, home furnishing purchases, setting up bank accounts, handling visa procedures, etc. Therefore, English-speaking Ecuadorians made the entire process of settlement for me relatively easy. Since I arrived, the expat community has grown, and more expats have lived here for a longer period of time, so there are many expats who can now be of help as well. The city government also established in the last two years a special security force in El Centro, whose members walk the streets around Parque Calderon. These security members are friendly, competent in English, and help both tourists and expats alike with their questions. Q: Would you say that formalities like getting visas or work permits and international health insurance was particularly difficult in Ecuador? What was your experience with these? A: When I arrived in 2011, procuring a visa was difficult. The government office responsible for issuing visas was in disarray. However, that problem was rectified later that year. Generally, the visa procedure is much easier to complete today. There are a myriad of health insurance policies both international and local, which need to be considered. Many hospitals in Cuenca also offer their own policies. Health insurance is relatively inexpensive in Ecuador compared with rates in the United States. The physicians and medical practitioners spend incredible amounts of time with patients in Cuenca compared with the time physicians spend with patients in the United States. Medical care ranks from good to excellent in Cuenca at a fraction of what the cost is in the states. Ecuador has not yet been ruined by the philosophy of maximizing profits at the expense of the customers, clients, or patients. Nor is Ecuador a culture of people who are quick to sue. By far, the most negative problem with which I have had to deal as an expat has been governmental and financial institutional bureaucracies. Whether here in Ecuador or with institutions in the United States, it makes no difference. Bureaucrats make up rules as they go along, or they are often misinformed. Information procured by one bureaucrat will be contradicted by another bureaucrat working out of the same office. Handling investment transactions, moving money in-and-out of countries, complying with both the United States and Ecuadors’ financial information forms have become much more complicated than when I first arrived in Ecuador in 2011. The changes with financial and government procedures and the complications caused by them are always on-going and never-ending. That, for me, is the most negative feature in living abroad, and an issue that many future expats give little consideration. A: I am divorced, and I live alone. I have two adult sons. One lives in the United States, and the other son soon will relocate to the Middle East. A: It was extremely easy to make new friends and meet people in Cuenca, especially when so many new people were arriving after “International Living” magazine identified Cuenca as the number one city for retirement. There was such an excitement in the air among the new arrivals from 2010 through 2012. At one point, there were three “Gringo Night” venues, which successfully competed for new gringo trade, as well as for the dollars of potential gringos who came to visit and check-out if Cuenca was the right move for them. Expat nights at this point have run their course. However, there are a number of restaurants, cafes, and bars that cater to expat crowds. Expats are generally easy to meet on the streets and will normally be helpful. It is almost impossible for me to walk the streets of Cuenca, and not meet someone I don’t know. I mostly associate with other expats, but I have Ecuadorian friends as well. I don’t devote sufficient time to the study of Spanish. All of my Ecuadorian friends speak English, and all but one of them lived in the United States for periods of time. My Ecuadorian friends speak to me in English, because we can have a normal conversation in English since my Spanish is not at a competent conversational level. It is more difficult for me to understand Spanish when it is spoken to me, than it is for me to speak Spanish or to read Spanish. Cuenca has a population of 325,000 in the city proper. There are over 600,000 people in the canton, which is equivalent to a county in the United States. Cuenca is the big city with a small town atmosphere. There are about 4,000 expats, and almost all of them are from the United States and Canada. The expat population has maintained itself at about the 4,000 number. New people are continuously moving in, and others are equally moving out. 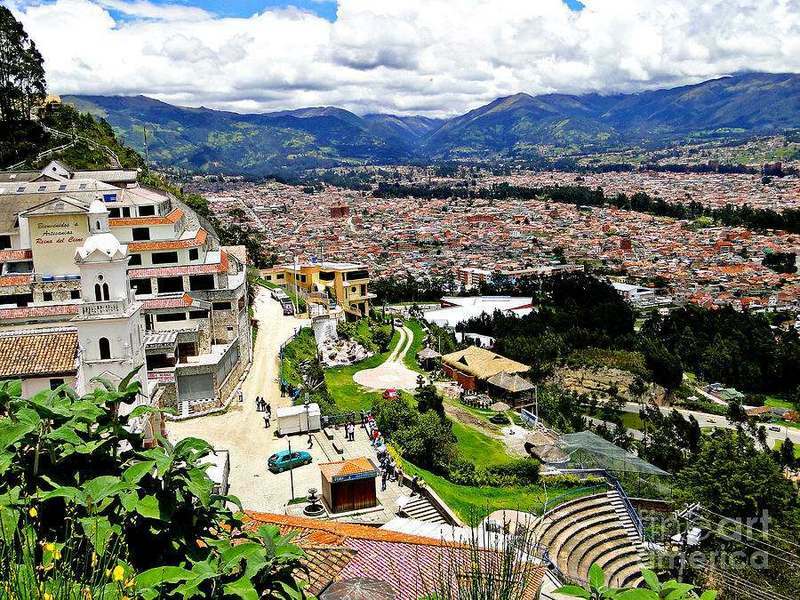 Some expats move to the nearby hinterlands outside Cuenca, or to other parts of Ecuador. Some expats indulge their wanderlust, and after they have experienced Cuenca for a few years move to another country to experience their next adventure. Other expats return to their home countries, generally because of family considerations or homesickness. We also have our share of expats who live in Cuenca just long enough to procure legal residency, and then return to the states. These expats have no genuine intention of living in Ecuador, but like to have legal residency in case things continue to become increasingly politically dicey in the United States. One change that I have noticed in the past year has been the increase in younger expats with children who are moving to Cuenca. Until recently, the vast majority of expats have been in the post-fifty age group. One thing about the expats in Cuenca is that they are scattered in every area of the city and in most neighborhoods. Even in neighborhoods where there are higher concentrations of expats, in none of these neighborhoods do expats make up a majority of the population. Geographically, there are no gringo ghettos in Cuenca. A: Cuenca is the cultural capital of Ecuador. Many of the cultural activities are financed by the national government. The many festivals, the city’ very fine orchestra, concerts, art exhibits, and stage performances are usually free. The city is resplendent with art galleries, and also has three major universities. Recently, the expats have been organizing art as well as stage performances in English. Many expats who may not act, are participating in painting backdrops, making costumes, applying makeup, and doing stage work like sound and lights. There is a cornucopia of dance classes, art classes, book-writing classes, sewing, knitting and weaving classes, Spanish-learning classes, yoga classes, and cooking classes. Some expats form their own bands that perform in local restaurants and bars. Many expats devote hours to charity or to missionary work. Many social groups among the expats have been transplanted in Cuenca as well. For example; fraternal organizations, English-speaking churches, new age groups, and military veteran organizations have all sprung up in Cuenca in recent years. Any expats who are bored in Cuenca has no one to blame but themselves. There is a plethora of restaurants in all price ranges, and an increasing number of international restaurants have appeared in Cuenca. We have an excellent Japanese restaurant, which includes some of the best sushi I have ever eaten. Cuenca also has some very good Italian restaurants. Tiesto’s has an excellent world class chef, Juan Carlos and offers by far your best meal in Cuenca for Ecuadorian or Andean food. If you visit Cuenca, Noe Japanese Restaurant and Tiesto’s are a must. I would like to see some good quality Thai, Indian, Mexican, and Caribbean restaurants open in Cuenca. We have some Caribbean and Mexican restaurants, and many Chinese restaurants, but none of them are very good. Is there anyone out there in the world, who can bring some outstanding Chinese cuisine to Cuenca, particularly with high quality dishes of Schezuan and Hunan? Because of all the Ecuadorian government import restrictions and custom taxes, it is difficult for some ethnic restaurants to keep a steady supply of the ingredients that are essential to the preparation of the authentic flavors required for their dishes. Cuenca is very much a walking city, and is also great for jogging. There also are a number of health clubs in the city. Cuenca lies at the entrance of the awesome Cajas National Park, which is great for hiking, camping, and trout fishing. There is literally something for everybody in Cuenca.